45 years ago on July 20, 1969, NASA astronaut and Apollo 11 Commander Neil Armstrong became the first human being to set foot on another celestial body when he stepped off the Apollo 11 Lunar Module Eagle and onto our Moon’s utterly alien surface. 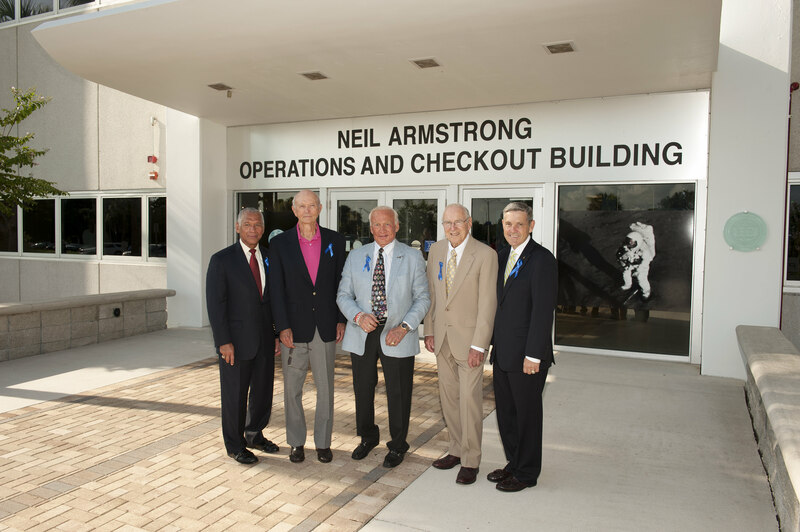 Today, July 21, 2014, NASA officially renamed a historic facility at the Kennedy Space Center vital to human spaceflight in honor of Neil Armstrong during a a 45th anniversary ceremony at what until today was known as the ‘Operations and Checkout Building’ or O & C.
On that first moonwalk, Armstrong was accompanied by fellow NASA astronaut Buzz Aldrin on a two and a half hour excursion that lasted into the early morning hours of July 21. They came in peace representing all mankind. Today’s ceremony was broadcast on NASA TV and brought together numerous dignitaries including Armstrong’s surviving crewmates Buzz Aldrin and Command Module pilot Mike Collins, Apollo 13 Commander Jim Lovell who was also Apollo 11’s backup commander, NASA Administrator Charlie Bolden, Kennedy Space Center Director Bob Cabana, and Armstrong’s family members including his sons Rick and Mark Armstrong who all spoke movingly at the dedication. They were joined via a live feed from space by two NASA astronauts currently serving aboard the International Space Station (ISS) – Expedition 40 crew member Rick Wiseman and Commander Steve Swanson. 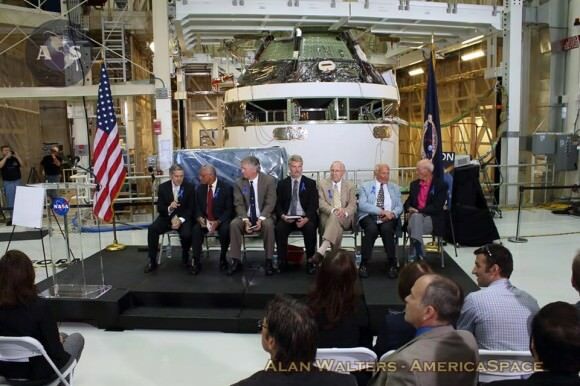 The backdrop for the ceremony was the Orion crew capsule, NASA’s next generation human rated spaceflight vehicle which is currently being assembled in the facility and is set to launch on its maiden unmanned test flight in December 2014. Orion will eventually carry US astronauts on journey’s to deep space destinations to the Moon, Asteroids and Mars. Many of Armstrong’s colleagues and other officials working on Orion and NASA’s human spaceflight missions also attended. The high bay of what is now officially the ‘Neil Armstrong Operations and Checkout Building’ was built in 1964 and previously was known as the Manned Spacecraft Operations Building. It has a storied history in human spaceflight. It was used to process the Gemini spacecraft including Armstrong’s Gemini 8 capsule. Later it was used during the Apollo program to process and test the command, service and lunar modules including the Apollo 11 crew vehicles that were launched atop the Saturn V moon rocket. During the shuttle era it housed the crew quarters for astronauts KSC training and for preparations in the final days leading to launch. The Apollo 11 trio blasted off atop a 363 foot-tall Saturn V rocket from Launch Complex 39A on their bold, quarter of a million mile moon mission from the Kennedy Space Center , Florida on July 16, 1969 to fulfill the lunar landing quest set by President John F. Kennedy early in the decade. Armstrong and Aldrin safely touched down at the Sea of Tranquility on the lunar surface on July 20, 1969 at 4:18 p.m EDT as hundreds of millions across the globe watched in awe. Mike Collins is TALL for a Gemini/Apollo astronaut!